Annals of Chemical Science Research is devoted to publishing articles on topics of current interest and importance in coordination of chemistry, interface of chemistry, chemical engineering, inorganic, organic and polymer chemistry, and includes aspects of organometallic, theoretical and bioinorganic chemistry, materials chemistry, medicinal chemistryphysical chemistry, analytical chemistry and not only in sciences but also on chemical engineering sciences. 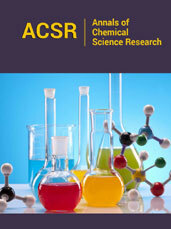 ACSR also publishes special issues based on the current research and advances. It also focuses on contributions from a specific country or area of the world, and contains the proceedings of invited lectures to major international conferences and e-books.ACSR is established to publish papers from all areas of chemistry and related fields. ACSR encourages researchers with novel and innovative research papers and gives them an opportunity to publish their papers and spread the knowledge all over the world. ACSR invites all types of articles like research, reviews, case reports, mini reviews, short communication, opinion etc.